The analogy between African-Americans in the era of segregation and Palestinians today is a false one. Alice Walker, the Pulitzer Prize-winning author, has lately garnered more attention for her unhinged political views than for her writing. She has compared Fidel Castro to the Dalai Lama. She refused to allow her book "The Color Purple" to be translated into Hebrew. But perhaps nothing was more off-base—at least morally speaking—than the open letter Ms. Walker wrote in late May to singer-songwriter Alicia Keys. Ms. Walker, writing at the website of the U.S. Campaign for the Academic and Cultural Boycott of Israel, urged Ms. Keys to cancel a July 4 performance in Israel. Ms. Walker wrote: "you are putting yourself in danger (soul danger) by performing in an apartheid country." The writer then compared the plight of the Palestinians to that of blacks in the American South prior to the civil-rights movement. "You were not born when we, your elders who love you, boycotted institutions in the U.S. South to end an American apartheid less lethal than Israel's against the Palestinian people." The analogy is false: "Apartheid" is a more apt description for the systemic discrimination against women across the Arab world than the only democracy in the Middle East. But this comparison is also an insult to the courageous civil-rights activists who risked their lives in Birmingham, Montgomery and elsewhere in the South to attain full rights for black Americans. The Palestinian leadership, by contrast, for decades has used violence whenever missile attacks or suicide bombers suit its aims. It is Israel that has shown an inclination to absorb punishment, though the country's tolerance stretches only so far before it responds militarily to attacks. The comparison that Ms. Walker and her comrades in the boycott-Israel movement make to the civil-rights movement is false in other ways. Unlike the American South decades ago, when local governments enacted laws and policies to prevent U.S. citizens from attaining full rights, Israel has tried repeatedly to reach an agreement with the Palestinians in the West Bank that would grant them sovereignty. In 2005, Israel even withdrew unilaterally from the Gaza Strip. We all know how that turned out. Those civil-rights activists who participated in the movement of the 1950s and 1960s—as well as others who remember the era—owe it to that noble cause to speak out when Ms. Walker and others distort and misuse this period in American history to advance an anti-Israel agenda. It also wouldn't hurt to remind people like Ms. Walker that no less a civil-rights leader than Martin Luther King Jr. was a fierce supporter of Israel. Days before his assassination in 1968, he said that "Israel is one of the great outposts of democracy in the world, and a marvelous example of what can be done, how desert land can be transformed into an oasis of brotherhood and democracy." Bayard Rustin, who organized the March on Washington in 1963, also believed in Israel's cause. In the late 1960s, when some black activists began denouncing Zionism and Jews generally, Rustin cautioned against joining "in history's oldest and most shameful witch hunt, anti-Semitism." Perhaps Alicia Keys is more familiar than Alice Walker with the true history of the relationship between the civil-rights movement and Israel. 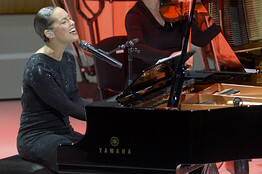 After the writer's open letter to Ms. Keys appeared, the Grammy Award-winning musician publicly rebuffed Ms. Walker: "I look forward to my first visit to Israel," she told the New York Times. "Music is a universal language that is meant to unify audiences in peace and love, and that is the spirit of our show." So the concert in Tel Aviv will go on. Here in Birmingham, meanwhile, the Jewish Federation is seeking to educate the black community and others about Israel, and it is urging community leaders to speak out against distortions made by Ms. Walker and others who boycott Israel. One local black leader who stepped forward immediately was State Rep. Oliver Robinson, a Democrat and a former All-American basketball player at the University of Alabama at Birmingham. Commenting on a FacebookFB +4.38% post commending Ms. Keys for saying no to Ms. Walker, Mr. Robinson wrote: "She made an excellent decision." This year, Birmingham is commemorating the 50th anniversary of a pivotal year for the civil-rights movement and for the history of our city. Those of us who live here are particularly obligated to combat the bogus analogy linking the Palestinians and the civil-rights movement—and to continually remind people that Israel remains America's best friend in the Middle East. Mr. Friedman is executive director of the Jewish Federation in Birmingham, Ala.